According to the Graphical Research new growth forecast report titled “Latin America Bitumen Market Size Report 2018-2024,” which is an analysis based on product, application, industry analysis report, regional outlook, growth potential, price trend, competitive market share and forecast, for those years, the region’s market is estimated to exceed USD 5.7 billion by 2024. The construction industry in Latin America was deemed to be a profitable quotient for the product market in the report, owing to the marked increase in the construction projects from commercial to residential development to infrastructure and industrial facilities. For instance, the construction of New Mexico City International Airport, inter-oceanic corridor to facilitate trade between Chile and Argentina, and planned development of San Lorenzo Island into a satellite city in Peru will provide the growth to the bitumen market. The product also acts as a sealant and adhesive—owing to its insoluble property, which is used for water resisting applications—and this is also expected to propel the bitumen market. On the downside, the fluctuation in oil prices is expected to provide some sluggish growth to the product market. 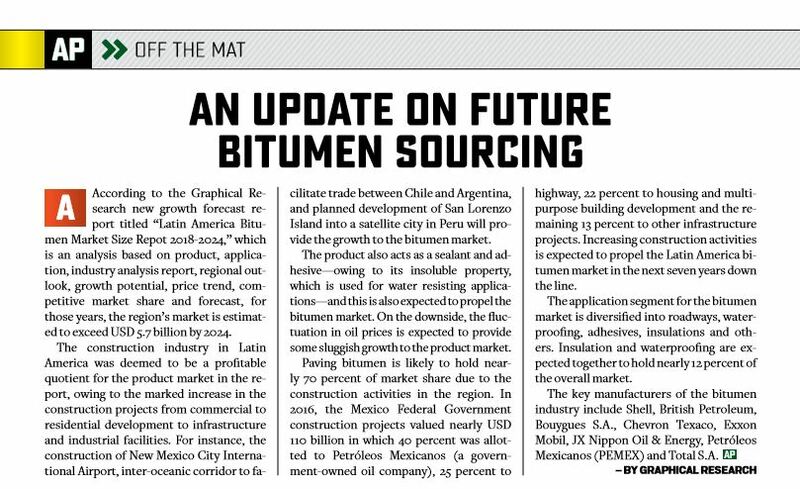 Paving bitumen is likely to hold nearly 70 percent of market share due to the construction activities in the region. In 2016, the Mexico Federal Government construction projects valued nearly USD 110 billion in which 40 percent was allotted to Petróleos Mexicanos (a government-owned oil company), 25 percent to highway, 22 percent to housing and multipurpose building development and the remaining 13 percent to other infrastructure projects. 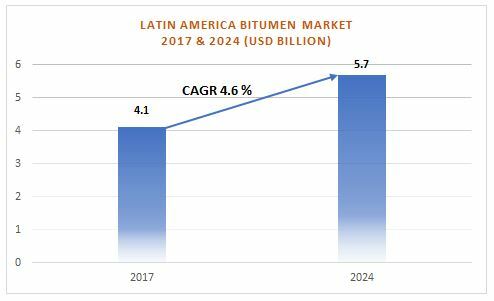 Increasing construction activities is expected to propel the Latin America bitumen market in the next seven years down the line. The application segment for the bitumen market is diversified into roadways, waterproofing, adhesives, insulations and others. Insulation and waterproofing are expected together to hold nearly 12 percent of the overall market. The key manufacturers of the bitumen industry include Shell, British Petroleum, Bouygues S.A., Chevron Texaco, Exxon Mobil, JX Nippon Oil & Energy, Petróleos Mexicanos (PEMEX) and Total S.A.